Raditz is Goku's big brother. Evil, like all saiyans, he came to Earth to destroy all life on the planet. 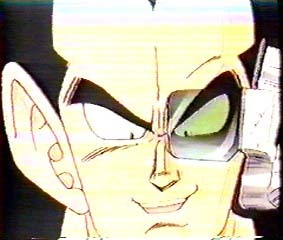 His fatal mistake was that he made Gohan mad... and... well, if you know Gohan you know that's one kid you don't make mad. Gohan gives Raditz a good blow that gave Goku time to stall him and let Piccolo give him a good Beam Cannon that killed Raditz.